Adventures in the Endless Pursuit of Entertainment: Hey @BettyBuckley - Can't wait to see you tonight, too! 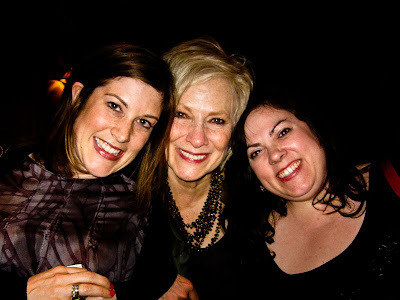 Hey @BettyBuckley - Can't wait to see you tonight, too! Karigee and I are taking in Betty Buckley's final performance at Feinstein's tonight. Betty is the best thing about February in New York City. POST FEINSTEIN'S UPDATE: Betty's set was everything I wanted it to be - all of the power, all of the introspective, all of the pulling of heart strings. I doubt there was a dry eye in the room after her stunning performance of "If You Go Away". After the show, I said to Kari, "Come on, let's go back and say hey to Betty." We did. It was thrilling. THRILLING! Thank you, Betty for another fabulous February and to Feinstein's for promising to bring her back next year - it can't come soon enough! If you hadn't gotten photographic evidence I would never have believed that it happened.